This is my project for Unicorn for the month of August. For this make I have used a Magnolia Tilda image called 'Love is in the Air'. Thank you for coming to look at my creation, I hope to see you back here in September when the fun really starts over at Unicorn with the launch of the challenges for you all to join in on. Super cute card! Thanks for joining our Anything Goes challenge at Simply Create Too! Awe she is super sweet! love your coloring, layout and details. Thank you so much for sharing your amazing talent with us at 4 Crafty Chicks Anything Goes Challenge. 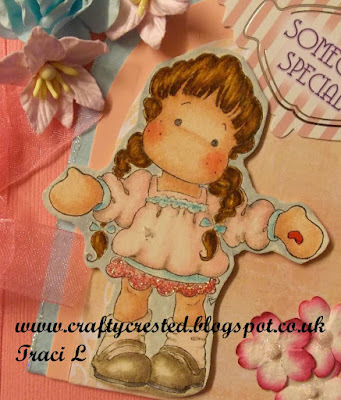 Very pretty card - thank you so much for joining in at the CCC Digi Creations challenge - all the best, and I hope we see you again. such a sweet sweet card! touching project with a beautiful layout! thank you so much for entering our anything goes challenge at Paradise of Stamps! This is really cute! Thanks so much for playing along with us at Inspiration Destination this weel. Lovely card ! thank you for joining us at LOC this week ! gorgeous colours Thank you so much for entering our challenge at Creative Fingers Challenge Blog this week. Looking forward to see you again next challenge. Very cute and I love all the pretty embellishments too. Thanks for joining in the Ching-Chou Kuik Challenge this time. Hope to see you again. Gorgous card. Beautiful details. Thanks for joining us at CCC digi Creation and good luck. Gorgeous....love your Tilda! Thanks for joining us over at Crafty Calendar this month & good luck! This is such a pretty card - you've reminded me that I should use my Gelly Roll pens!!! Thank you so much for entering the Crafty Calendar ('Bingo') Challenge this month, lots of luck to you. Lovely creation! Image and design are beautiful! I love colouring! 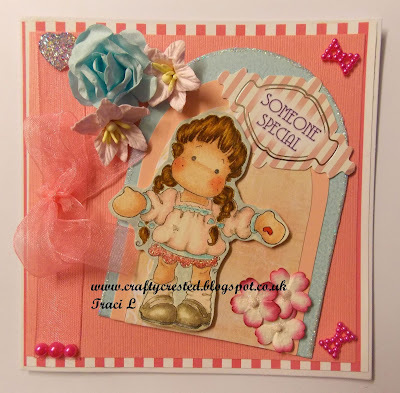 Thank-you for joining us at the Crafts Galore Encore August Challenge "ATG". Lovely card. Thank you for joining the challenge at Creative Fingers Hope to see you again next time. Very sweet card, lovely colour combo. Thanks so much for joining us over at Emerald Faeries Challenge Blog, good luck and hope to see you again. Crafty Pearly, what a stunning Tilda card you have made. It fits our challenge this month well of “a floral display”. Thanks for taking part and good luck. Best wishes, Kym (Ching-Chou Kuik Digital Stamps Design Team Leader). Sweet card and I love the colours you used. Thank you for joining in the Ching-Chou Kuik Challenge this time. Hope to see you again soon.